I had a chance to sit down with the nice guys as Raumfeld who have the latest entry into the wireless speaker system category. During a morning meeting, I saw their full line of speakers which is similar to the basic set for competitors like Denon and Sonos. Like it’s competition, Raumfeld also has a play bar to accentuate TV sound, a sub-woofer and then three levels of speakers that can be used as single speakers or dual speakers to create home theatre sound or fill rooms big or small. Raumfeld does have a larger range than other manufacturers, so more choices but also more customization to your living situation. The biggest draw to these speakers is that you can avoid re-wiring the house if you want to control sound throughout, or finally get rid of the clutter of an older system. The latter is what prompted me to dump my old college receiver and speakers in favor of a SONOS system two Christmases ago. I don’t think any manufacturers promise to deliver better sound quality than an analog stereo system using big speakers, but you do get nice looks, connection to music services and full control from mobile device or laptop. All the marketing materials for the wireless speaker companies make big promises for even their small speaker’s abilities to fill a room with sound. However, a small speaker, even from the best company, can only do so much. The trick, or financial challenge, is to buy the size of speaker or speakers you need to fill the room you have rather than hope that a $199 single speaker could somehow duplicate your current big speaker system. I don’t pretend to be an audiophile, but I do like what I consider good music: jazz and classical with a smattering of pop thrown in. The Raumfeld demo I heard provided rich sound, good bass and improved TV. If you’re really serious about sound quality — the last 1% of sound difference — look to experts to delineate between the sound in different systems. What we can help with is ease of use, attractiveness of cabinetry, and additional features. The guys at Raumfeld gave me a Raumfeld One S, just now available for sale in the U.S. to try out the features in my own house. * Ease of use: a Raumfeld system was very easy to set up. The iPhone app interface walks you through a few simple steps to connect to your WIFI and you’re done. * Appearance: All speakers have a black front but you have the option of white or black trim. The unit is a standard box size, which is good if you need to fit into a bookcase. 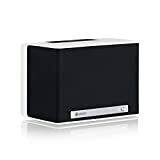 * Price: Competitive with SONOS Play 1 ($199) at $249 at Amazon. As of February, SONOS and Denon have a big lead in the race to add music services. Raumfeld has just added SoundCloud and will add Google Cast including Pandora, iHeartRadio and other popular services this Spring. What Raumfeld has that (all?) other speakers don’t is a series of buttons on the top of the speaker which can be used for preset music services or radio. Sometimes you don’t want to pull out your phone to change the channel. Like its competition, box-top controls also feature volume up and down. I like the Raumfeld look and sound and would recommend it among options in the category. If your favorite music service is not among those offered by Raumfeld, it likely will be at some point. On the other hand, it’s worth checking out the current list to avoid disappointment after you plug it in.